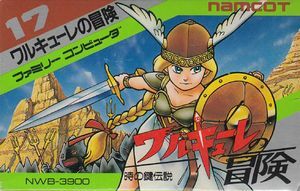 Valkyrie no Bōken: Toki no Kagi Densetsu presents a scrolling overworld like Dragon Warrior, but features a real time combat system similar to The Legend of Zelda. 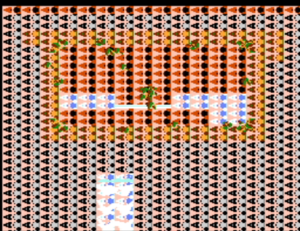 Player controls the Valkyrie in her quest to defeat Zouna and restore peace to Marvel Land. Initially, the Valkyrie starts the game off rather weak, armed with nothing but a short sword. She will appear with brown hair and no helmet. Over time, player will help her fight monsters, collect gold, and find stronger equipment that will raise her offensive and defensive powers. Eventually, when she finds a helmet and cloak, she will appear as you see her on the covers of the game's box and cartridge. With all of the citizens of Marvel Land scared, or under Zouna's control, the Valkyrie will receive no help from anyone in the form of hints or advice. Player and the Valkyrie are completely on their own when it comes to discovering all that Marvel Land has to offer. Player will need to use your wits to devise a plan that will help you defeat Zouna once and for all, and many of the tasks that lay before the Valkyrie are not obvious. Some can only be surmised by exploration and experimentation. The graph below charts the compatibility with Valkyrie no Bōken: Toki no Kagi Densetsu since Dolphin's 2.0 release, listing revisions only where a compatibility change occurred. This page was last edited on 31 December 2017, at 04:42.